It’s easy to write down things you want to do. But HOW do you get them done is the key and HOW do you go after them is what makes the difference between accomplishing a goal and just having it be words on paper. In day 4 of our RAP plan review, Mario shows you what you need to do to build the momentum to make effective goals. Thursday, it’s time to Wake Up and Level Up. You are smack dab in the Reflection Action Plan week. That means I have given you the opportunity to download for free. 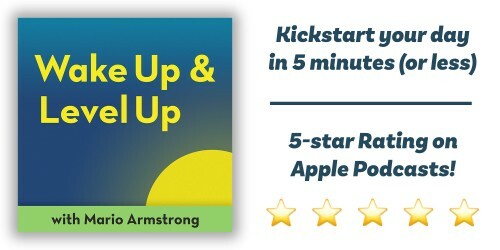 As a loyal and or new podcast listener, you get first access to marioarmstrong.com/goals. Go there right now while you’re listening to this episode, marioarmstrong.com/goals to download your reflection action plan. This nine page document is going to set your 2019 on fire each day. This week I’ve been talking a little bit more about the plan, giving you advice on how to fill it out, examples and so on and so forth. Today, I wanna talk a little bit about what happens around pace three through say six, which is really the daily affirmations part, as well as setting the goals to set you up for the next 90 days. Now, daily affirmations or something that you review and that you read every single day to inspire you to keep you on track with your goals and dreams. If you don’t wake up and know what your affirmations are, it’s very hard to stay consistent with what the goal is. You know, some of the most structured people can maybe do that. They have a very clear vision. They know exactly what they’re getting up to do and they’re very organized in their day and they’re very focused. Not Everybody operates like that. In fact, most people don’t operate like that and they need the daily affirmations, the things that you would review that you need to believe about your potential every single day so that these things over time become fact. When I said I wanted to win an Emmy for the talk show, many people thought I was crazy. We didn’t even have a talk show out. The show wasn’t even recorded and I was already meeting with the team, reviewing the documents and printing out 35 pages of the Emmy submission guidelines because I was affirming it in my mind. Every day we’re going to build something so special, so great, so valuable that the Academy, that the Emmys, that that judging team that the peers will have to recognize how much we put into this. That was an affirmation. Getting the show to launch. I will launch the Never Settle Show that was an affirmation. I will get a sponsor that was an affirmation. Here are some examples of my affirmations for the next 90 days. According to the reflection action plan, I will connect with more collaborators. I will create more family experiences. I will connect with large distribution and impact for our content. By the way, are you hearing the word connect? Showing up. Remember my word for the year. We talked about this a couple of days ago. I will study harder to connect with audiences and people better. Hello? I will become the best in providing thoughtful advice that creates positive change and connects to other’s lives. A lot of times around this time of year, people start thinking about their finances or their health, like losing weight or making or saving money better. So you may want to have some affirmations that are very specific, like I will run a marathon or I will run a mini marathon this year, or I will lose two pounds per week, or I will run 1K Per day. You have to be very specific. I will save $225 and seventy two cents every month. Whatever it is, just make it very specific in terms of your affirmation and say it every single day. That’s what’s also in this plan. I put this in here to make it easy for you. I also want you to make it a reminder in your phone so that you can go back and make sure that you’re saying these affirmations throughout the day. Then I get into a section where we actually do what’s called the 90 day reverse engineer goal worksheet and this is meant to give you a timeframe to accomplish your goals without being overwhelmed. This isn’t for the whole year, although once you do these 90 days, you could learn from what you’ve learned and then you can reapply that for quarter after quarter after quarter. Now your 90 day goal must be very insanely specific. You have to be able to measure your progress effectively and without specifics you won’t be able to. This is one of the major reasons why most people do not hit goals because they do not make them specific enough. Okay? This is a big deal. For example, I have had to allocate two to three hours on weekdays in order for me to stay committed to achieving the goal that I set. I’m going to be using the pomodoro technique. I’m going to be all the things I’ve taught you I’m going to be using, but my 90 day goal, I’m putting it straight out there, is that I need to raise $305,220 and I need that for the never settle show production of 12 episodes my month. One goal is going to be the send out 30 proposals for the Never Settle Show. Then I have you go through, well, what are three things that could hold you back from achieving your goal? This is important to think about. No one plans for the road bumps and the obstacles and the challenges, so I go, I need to develop custom ideas for each proposal. Okay, where’s that coming from and what resource, what time? Number two. I also have to make custom graphics for each proposal. That means I probably need to alert Shy the minute that I can come up with the 30 names. I’m going to now offload that for something for him. See how I’m doing. I’m trying to figure out how to allocate the resources and try to minimize the things that could hold me back. All right, and then number three, I have to obtain the correct contact info for the person to send each pitch to. Doesn’t matter if I’m setting a goal to get $300, $5,000, sending out 30 proposals if I’m sending them to the wrong people. These are all roadblocks and hiccups and challenges that if I see in advance. I can really work to minimize them, thus creating way more effectiveness for me. And then I go into how you need to plan for your weeks and then how you go into your day. So this is very thorough. So go get the plan, stop listening to me. Go right now to marioarmstrong.com/goals. Download this free plan and send the link to five other people. Send it via email, send it via text, get five other people to do this. And if you’re just tuning in to this series, go back and listen to every day this week, especially Monday because I tell you the four most important things along with this plan that you need to do in order to get to the most probable success of achieving your dreams and your goals in 2019. All right. Now that I woke you up, it’s time for you to level up.